I’ve done crafts my entire life but started stamping in 2002. I like heat embossing because it’s quick and makes a big statement. I like black for my base card. After that it’s whatever works out best with a particular image and what I have on hand. Honestly, I’m embarrassed to say I have twelve 12 X 12 plastic bins that contain pattern paper and most are filled to the brim! How did this happen??? I just love paper, I guess! When I started with OSA I had one or two images and now I have two bins of stamps. I like people stamps, especially children. I love nature too, especially delicate birds, butterflies, dragonflies. Memento Tuxedo Black Ink. I use it all the time. I have learned so much from this group. I say keep on doing what you’re doing because this is a fun group to be associated with. I like the elegant simplicity of oriental art. I read Rubber Stamp Madness, Somerset Studio, Journaling by Somerset Studio…all their publications are excellent and informative. These magazines jump start my creative juices. No, but I sure would like to be. Only once have I sent in a project. I’m a voracious reader. I love to scrap and often attend fundraiser crops with two of my scrapping buddies. I have made hundreds of cards for our local NICU Milestones program. With each milestone the preemie achieves (first bottle, first bath, weight gain, tubes removed, etc.) the parents are given a card with a photo of the baby. It’s wonderfully fun for me to create these cards. None. What really unleashed art to me was a grief class I took telling our story using collage. Oh my goodness I spend way too much time on blogs but I learn so much. I subscribe to many so I constantly get input on trends, new products, etc. The first half of my life I was a nurse. The second half I managed a fast paced church office. I am retired now but volunteer in our local neo natal unit as a Cuddler (cuddle preemies) and I am also a Compassionate Companion (sit with someone dying who has no family). I live in Southwest Michigan (Kalamazoo), halfway between Chicago and Detroit. I had a wonderful husband for thirty-four years, two lovely daughters, but lost the youngest nineteen months after my husband died. My eldest daughter has four beautiful adult daughters of whom I am so proud. They live in Colorado. One of them is also a stamper. They are such a blessing to me. As of January I have been stamping/cardmaking 2 years ! A friend of mine who’s been stamping for over 15 years introduced me as it’s very therapeutic and a great stress reliever !!! I’m honored to be selected as the May SAM. I only wish I was more artistic with drawing so I could have done a better job with faces. May 5th is Children’s Day in Japan, celebrating the healthy growth and happiness of children. It became a national holiday in 1948, but has been a day of celebration since ancient times. Families often take baths sprinkled with iris leaves and roots. It is thought to promote good health and ward off evil. Rice cakes wrapped in oak leaves and filled with sweet bean paste are also eaten. Cut or punch all pieces. Glue or tape Washi dress to body piece. Add Y shaped piece (I looked for a Y in my fonts to find one I could work with and enlarged it to size I wanted). Cut enough of the hair punched piece to reveal face. Notch it to look more like bangs and glue to face piece. Turn it over and add topknot to back of hair. Glue tip of head piece to front of body piece. Apply the obi strip and trim overhang off. Apply the two fan shaped arm pieces with the point out (as if the elbow was inside the sleeve). Cut one 3/4 inch circle in half and apply to bottom of body for the feet. For the eyes draw a simple curved line and a dot for the nose. I was lucky enough to find a teeny tiny heart punch for the lips. I added and extra piece for strength on the back side connecting the upper body and head piece. If you want the paper doll to stand up you can cut a piece of heavy cardstock 5 1/2 inches long by 1 inch wide, fold in half and glue or tape on the back. Congratulations Peg! Love the dolls. Enjoy your month as SAM! Enjoy your month of being SAM of May. 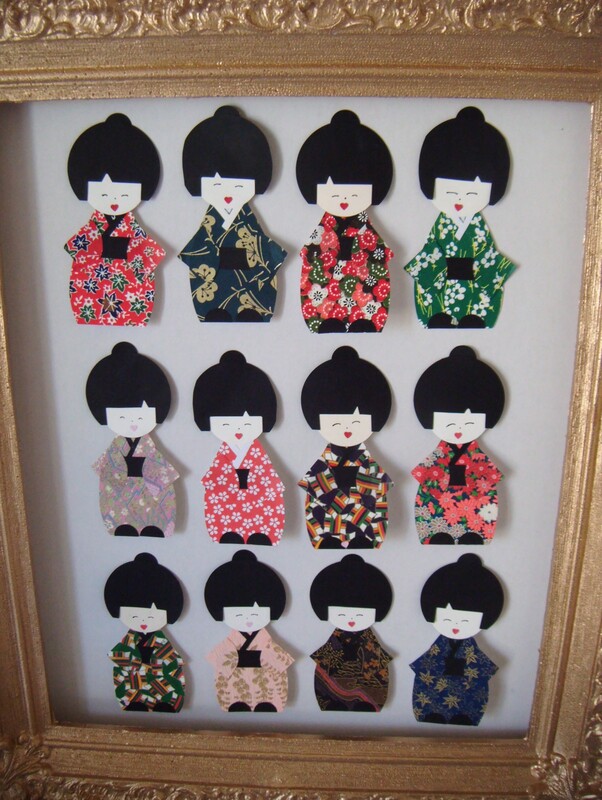 Wonderful project you did on the Kokeshi dolls…..I like it very much. Your project is beautiful, Peg; but your story is amazing and inspiring. I know from first hand experience what beautiful art you make, and I can’t think of anyone more deserving of this recognition. What an honor to be SAM for May. Your art is exceptional and it is obvious through your comments here at OSA that you are a very caring person and now after reading your bio, I feel that I understand and know you much better. You perform a great service to your community and the rewards must be overwhelming. Thanks for the instructions for making the paper dolls; they are darling. these are adorable! I will have to try these. I am always looking to fun package decorations for my sister’s gifts- she lives out of state and these would be perfect since they lay flat. Congrats Peg to be SAM for May!!! Your dolls are adorable…thank you for the instructions…will have to give them a try – they really are amazing! Love your project. I woud have never thought of it. Great job!